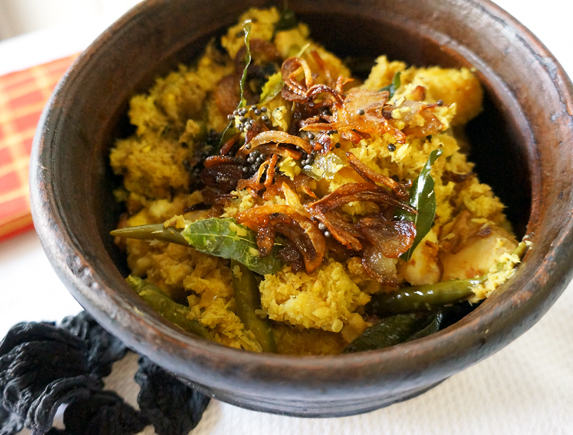 Today’s recipe is one that I learned from one of my Mangalorean friends while I was in Manipal. I found a lot of similarities in the way we both prepared this dish. Both of us used coconut, curry leaves, garlic, and chillies. So, I shared my recipes from Kerala with her in exchange for her Mangalorean recipes. 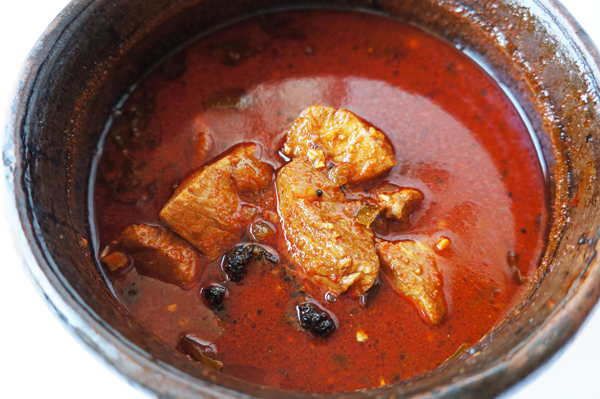 This fish curry uses tamarind as a souring agent. I added an extra seasoning of two teaspoons of oil, mustard seeds, and curry leaves before I took the above picture, but that is optional. All you need is a pot of steamed rice to relish this fish curry. I hope you will enjoy it as much as I did. Using a paper towel, pat the slices of fish until dry. Rub a little salt and turmeric powder over them and marinate them in the refrigerator for 10 minutes. In a small pan, over medium-low heat, roast the chillies, coriander, cumin, peppercorn, and fenugreek seeds until fragrant. Cool completely. Add all the roasted ingredients, half of the chopped onion, garlic, and half cup of water to a blender and grind to a fine paste. Place a large saucepan over medium-high heat. Add oil, and when it shimmers, add the mustard seeds. When the mustard seeds splutter, add the curry leaves, and the rest of the chopped onion. Sauté until onion is lightly brown. Add the ground paste and cook until the oil separates. Add the coconut milk, tamarind extract, half cup water, salt, and fish slices. Stir gently, cover with a lid, and cook over medium heat for 15 minutes or until the fish is cooked. Garnish with curry leaves. Serve with steaming hot rice. Tuna cutlets used to be a popular item on my menu several years ago. I made some over the weekend so I thought I would share my recipe with you. The list of ingredients may look daunting but this recipe is a keeper and you will be happy you tried it. Sometimes I add a handful of chopped walnuts into the mix and it adds a great crunch to the cutlet. You can use these cutlets as a side dish, an appetizer, or a snack. I have used them in sandwiches with a chipolte mayonnaise spread or cilantro and mint chutney. I’ve also eaten them just rolled up with some chopped onions in a naan or paratha. Eat them any way you please! Drain and flake the tuna using a fork. Set aside. Heat a non stick pan over medium high heat. Add three tablespoons of oil and when it shimmers add the chopped onion and fry until the onions turn light brown. Add ginger, garlic, and green chillies. Sauté for two minutes. Turn the heat to low and add the chilli powder, pepper, turmeric, garam masala and two teaspoons of salt. Sauté for a minute and then add the tuna. Fry until the pieces of tuna turn light brown. Add chopped cilantro and lemon juice and turn off the heat. Let the tuna mixture cool for 10-15 minutes and then add the mashed potato. Mix well with a potato masher. At this point you might want to taste to see if you need more salt. Form the cutlets into whatever shape you desire. Arrange the breading ingredients in an assembly-line fashion. First, in a shallow dish season flour with ¼ teaspoon salt. In another shallow dish, whisk eggs with one tablespoon water and ¼ teaspoon salt. In a third shallow dish put the panko bread crumbs. Working with one piece at a time, dredge both sides of the cutlet in the flour, knocking off the excess. Then dip both sides of floured cutlet in the egg mixture. Finally, coat both sides of the cutlet with panko bread crumbs. Set a large 12-inch skillet over medium-high heat and pour in enough oil for shallow frying, about one and a half inches. When the oil is hot, about five minutes, add the cutlets. Fry them in batches rather than over crowding the skillet. Fry the cutlets until golden brown on both sides. Transfer them to a paper towel-lined tray. These cutlets can be served with a cilantro and mint chutney. The recipe for the cilantro and mint chutney can be found at the bottom of the Bangalore Vadais post. This classic Kerala fish curry is cooked in an earthenware pot that is called a “manchatti” in Malayalam. When I moved to Washington, my mom gave me a small manchatti which I used to cook the fish curry that you see in the picture. You can use any fresh, fleshy fish of your choice to make this dish. The curry tastes best the day after cooking it. There are many variations to this dish as there are Malayalee homes! I say that because my red fish curry tastes a little different from my sister’s version. I use Kashmiri chillies to give it its bright red color and hot dry red chillies to give the dish heat. You can reduce the number of chillies to suit your taste buds. My son, likes his fish curry to be hot so the curry I make is very spicy. In a small pan add the chillies, coriander, and fenugreek seeds and roast them over medium low heat. When they smell fragrant, remove, cool and powder in a spice grinder. Soak the Malabar tamarind in warm water for 15 minutes. Drain and dry on a paper towel. Place the manchatti or pot on medium high heat. Add coconut oil and when the oil is hot add mustard seeds. When they splutter add curry leaves, ginger, garlic, shallots, and the Malabar tamarind. Fry for about 30 seconds and then add the powdered spices. Immediately add 2 cups of water and salt. Stir well and when it boils add the pieces of fish. Turn the heat to medium low and cook until the pieces are done and the gravy thickens.